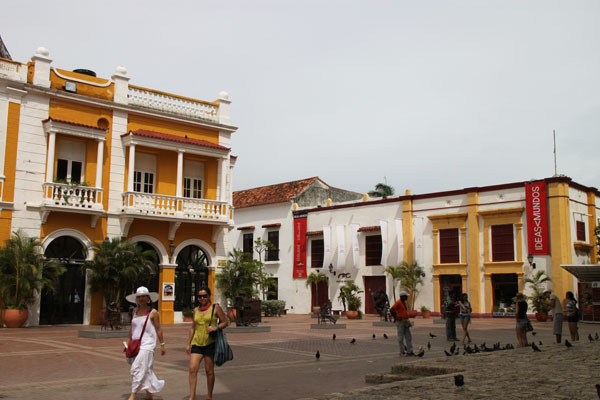 • Cartagena’s New City, which is quite near the Old Town, began to develop in 1967. An area of sleek high-rises overlooking Cartagena’s bays, it encompasses the city’s commercial center, plus modern residential neighborhoods and resort hotels. 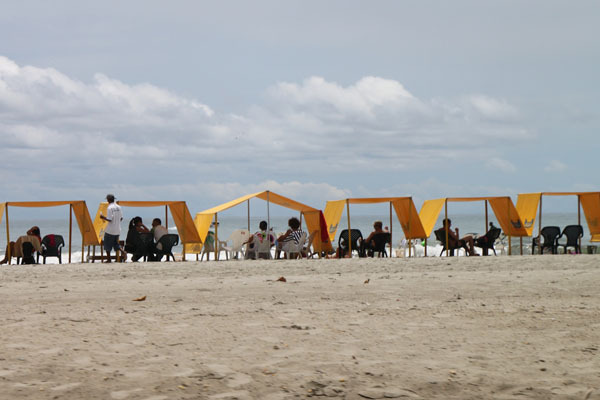 One of Cartagena’s many public beaches. 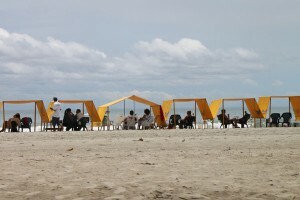 The sheltering tents that line the beaches are sponsored by advertisers. 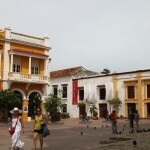 On Cartagena’s Plaza de San Pedro, the Cafe San Pedro is in the building at left. The shorter building at right is the Museum of Modern Art. • We ate in a wide range of eateries, but one of my favorites was San Pedro Restaurant in Plaza de San Pedro, partly for the food (several seafood dishes) plus the smart decor and the general ambience of a bright Old Town location. Quite a few eateries have delightful Old Town settings, I must add. San Pedro was one of the places in Colombia where we noted the presence of a private guard at the entrance. 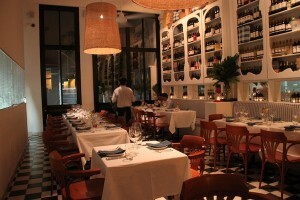 My top choice for eateries was the classy Don Juan Restaurant, an “in” spot in Cartagena with a young chef. 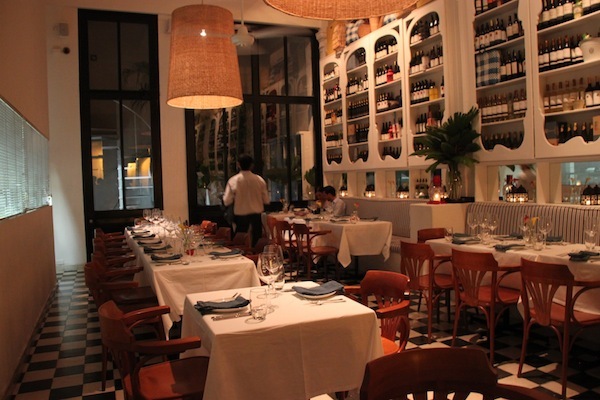 The interior of Don Juan Restaurant, a gourmet eatery in the heart of Cartagena’s Old Town — where reservations are necessary. 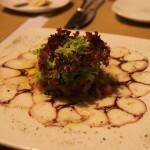 Octopus carpaccio, served in El Santisimo, a Cartagena restaurant. and salmon was the most exciting part of dinner here. I chose fish for my main course, too. We were on the Caribbean, after all. The interior decor included floor-to-ceiling displays of wine bottles and other paraphernalia running the length of one long wall and with the kitchen visible through glass walls along part of the other long wall. 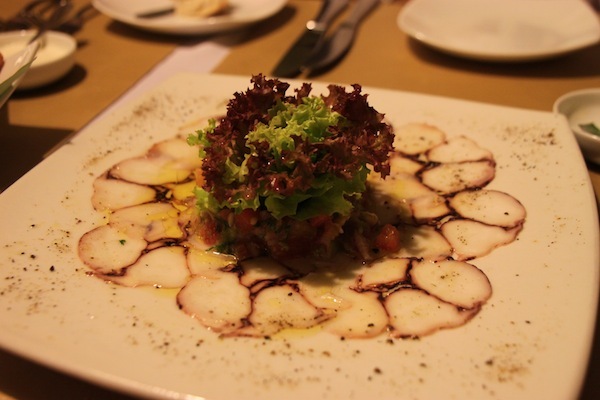 Overall, the surprise taste discovery for me was octopus, beginning on day one with octopus carpaccio in a salad with tomatoes and avocado at a restaurant called El Santisimo. It was nothing like the foods Mom made.